There are a lot of mixed reviews about Ichigo Ichie. I’ve been there a few times and I am also unsure of how I feel about this restaurant. There are some excellent parts of it and you can easily go to the restaurant two times in a row, but still get a completely different experience due to the hibachi grill section. 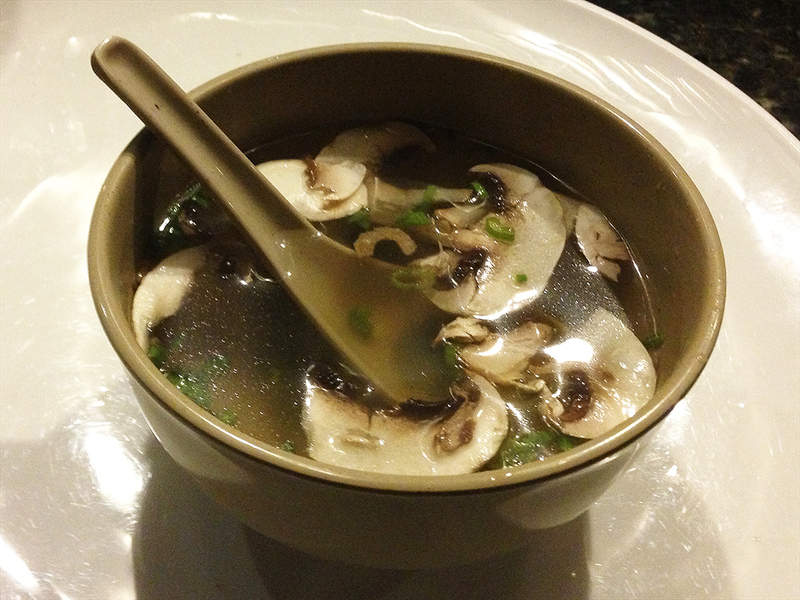 It’s a fancier Asian-style restaurant for the area with some fancy restaurant prices. The food is creative, but the quality doesn’t necessarily live up to the effort that went in to the interior design of the restaurant. The packed dining room and parking lot would suggest that people do love eating there, but most people I’ve talked to make comments on the experience rather than the food. 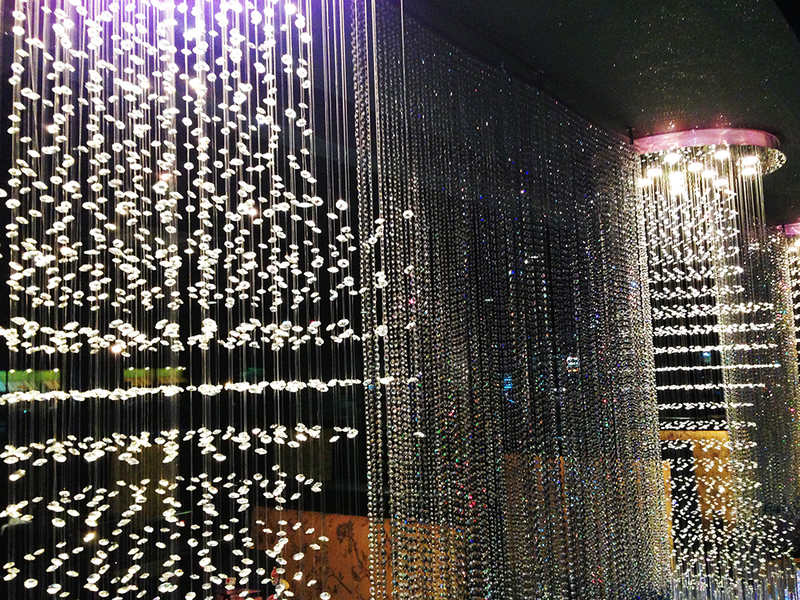 At Ichigo Ichie, what you really end up paying for most is the atmosphere, which is actually pretty nice. The interior is well decorated in what approaches gaudy, but stays on the right side of the line. The dining area has two sections with different styles of decor. 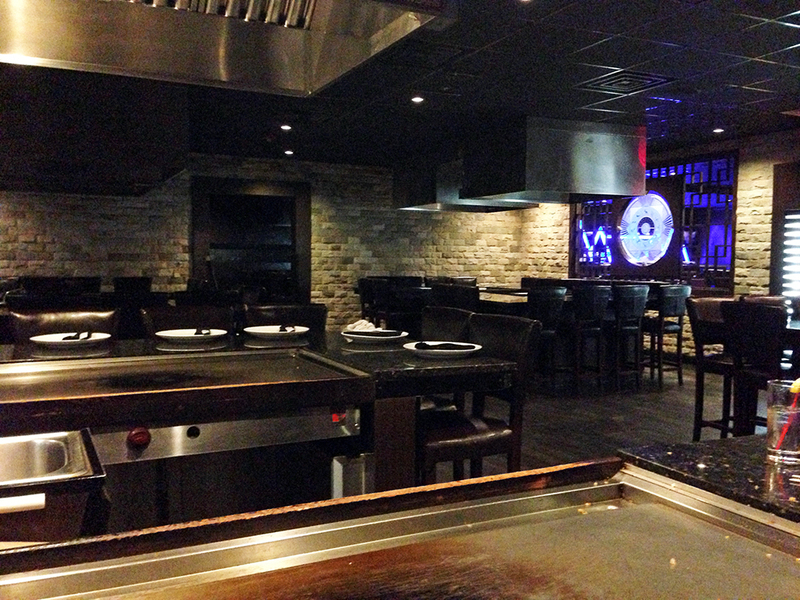 The main dining area is a little more glamour, while the hibachi side is more like a steakhouse with hibachi tables. The hibachi chefs are always fun and even if they weren’t, it’s hard to dislike someone that is willing to pour free sake (rice wine) in your mouth while he cooks! The sushi at Ichigo Ichie isn’t bad. It’s not the best by a long shot, but it’s pretty creative. Unfortunately, you’re paying more for creativity than for great flavors. 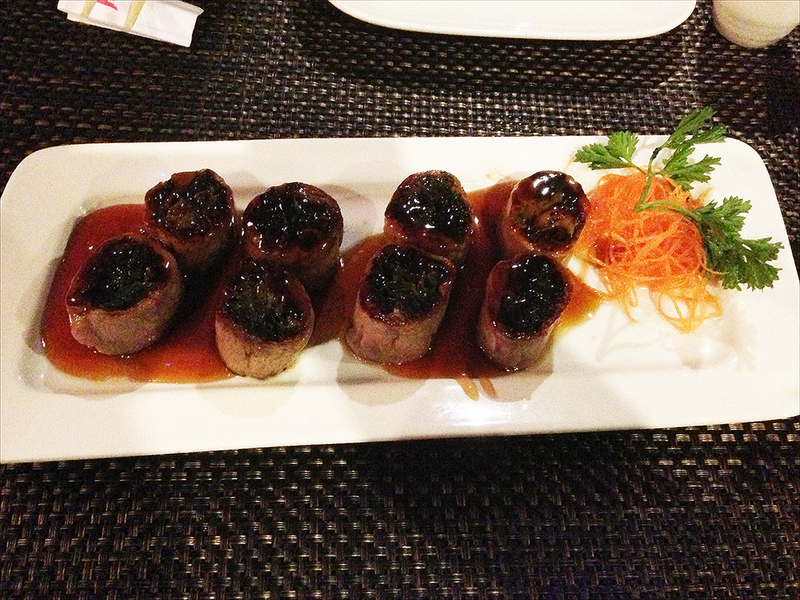 Nonetheless, it’s definitely the place to go if you feel like trying some fusion style sushi rolls. As far as the appetizers go, they are kind of hit or miss, but when they hit, they’re awesome. Rock Shrimp – This appetizer is extremely good! My brother recommended it to me. It’s battered and fried shrimp tossed in a sweetly spicy sauce. Then it is served with a palette of mustard and other sauces. The picture below is terrible, but the actual plating of the dish isn’t much better. It’s unfortunate that this dish looks so unappetizing because the flavors are really excellent. 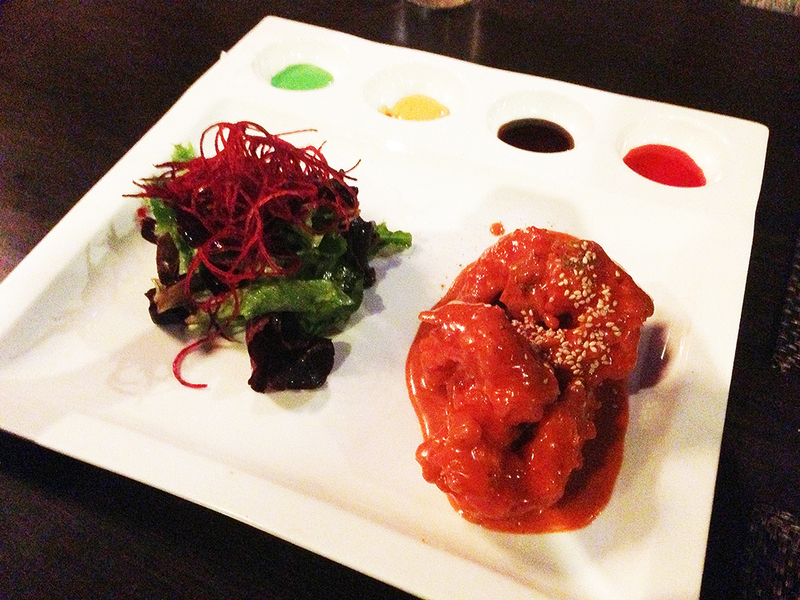 Beef Negimaki – This is an interesting appetizer on paper, but the flavors didn’t really deliver. The menu describes it as, “Broiled Sliced Steak Rolled with Fresh Scallion, Smothered in Teriyaki Sauce.” That is a proper description, but I was surprised that the outside of the roll was the steak. The overall texture of the dish didn’t really work because the thin slice of meat wasn’t enough while the surplus of scallions in the middle weren’t very crisp. It’s not a bad dish, but it could use some reworking in terms of assembly. 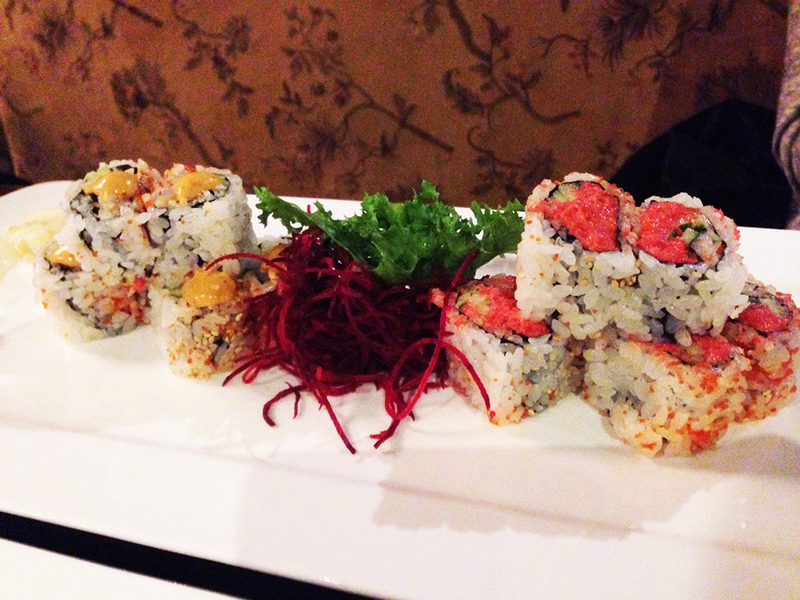 Spicy Tuna Roll – It’s hard to go wrong with a Spicy Tuna Roll at any sushi restaurant. They are pretty standard across the board and these were no different. They were nice, a little spicy, and delivered on the usual flavor as expected. Jalapeno Yummy Roll – This was a fun fusion style sushi roll combining Asian flavors along with some Mexican ones. 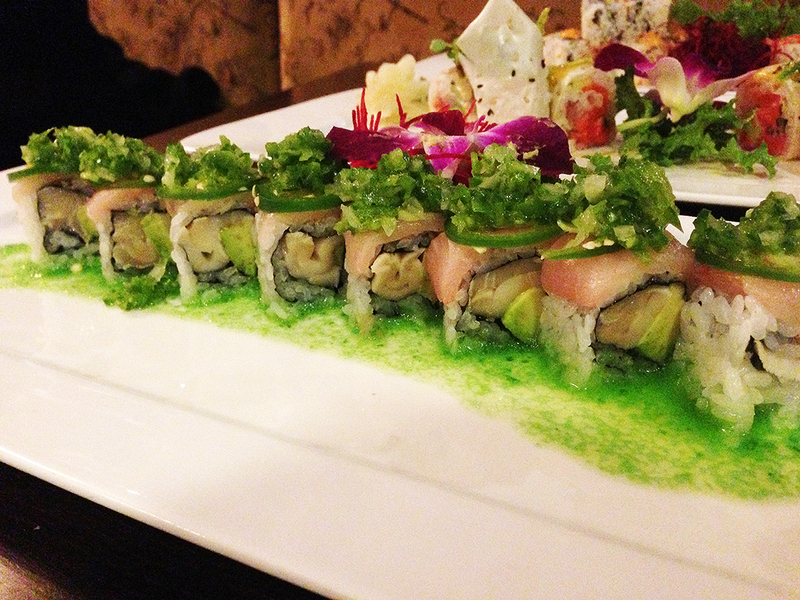 White tuna inside, Yellow Tail Tuna outside, avocado, and jalapeno composed this roll. It’s a strange combo with the jalapeno, but I had a dish like this before and I enjoyed it. Unfortunately, the flavors didn’t really meld into one unified roll in this case. Even though it was interesting, the roll fell short for me a bit. 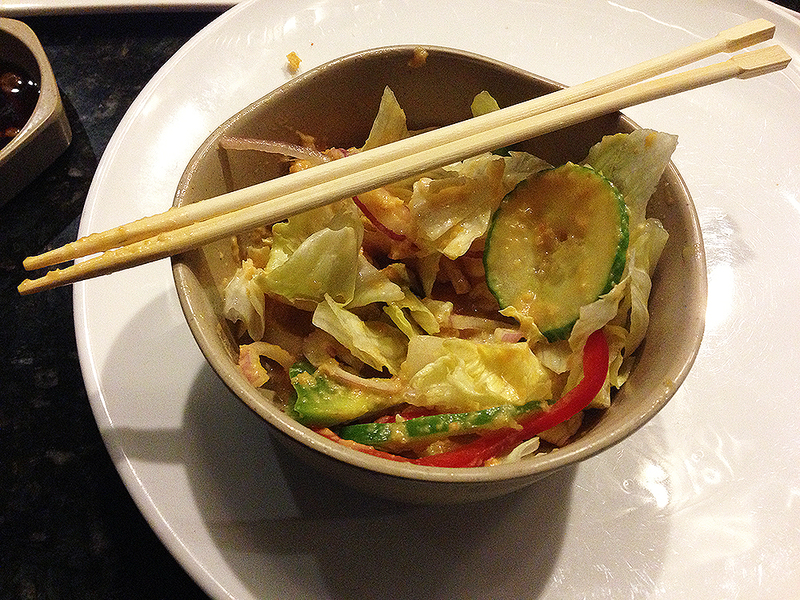 The hibachi side of the restaurant is a different experience altogether. The food is decent, but again, what you are paying for is the experience of watching a trained hibachi chef cook in front of you performing tricks and comic entertainment. 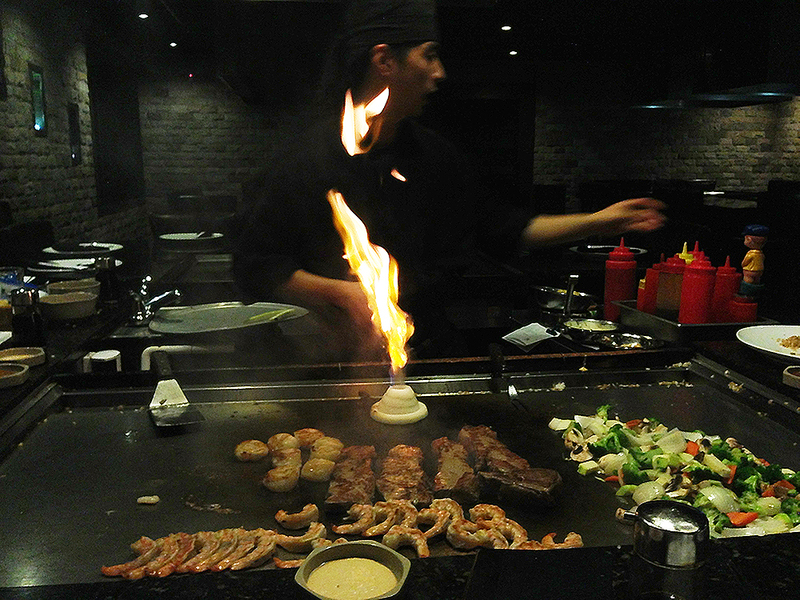 The meal starts off with the chef setting the grill on fire, which shoots flames into the air. It’s a great way to start, but it can scare little children, like my cousins, easily. The next part of the meal has the chef take your order (you can also order sushi at the hibachi bar), which is usually some kind of rice, vegetable, and meat combination. As he does this, the first parts of the meals come out which are a standard, very light mushroom soup, and a simple iceberg salad with house ginger dressing. The chef starts to cook immediately. Tricks ensue as he tosses shrimp in the air, creates an onion volcano, catches things in his hat, throws vegetables in the air to willing customers willing to catch them with their mouths, and even has a squirt bottle full of sake that customers can drink from if they are willing to catch the alcoholic liquid in mid air! The food itself is decent as I mentioned with most of the ingredients just tasting like a classic, no frills stir fry with some char on everything. One of the issues I had was that even though the chef asks how you want your beef cooked (rare, medium, well done, etc)., I’ve never gotten the meat anything other than medium-well or well done. The reason is that sometimes the ingredients mix on the grill with other similar orders, so you kind of just get whatever the chef gives you. Plus the temperature control is probably limited to just one temperature. Nonetheless, if you can set that aside, the meal is fun and enjoyable. If Ichigo Ichie didn’t have the atmosphere and dining experience that it gives you, I would easily say that the restaurant is over-priced. 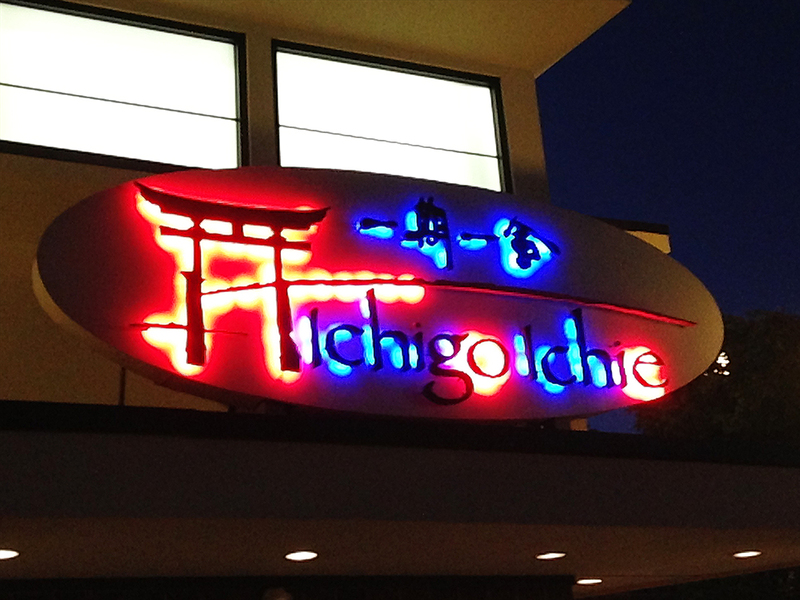 That may not mean much to people simply looking for the best food in town regardless of flashy appearances, but for those seeking atmosphere as well as a meal, then Ichigo Ichie may be right for them. Everything is slightly above average in terms of taste, but none of the food is at the highest level in its category. I would recommend Ichigo Ichie simply as a place to break up the monotony of your usual go-to sushi restaurants. 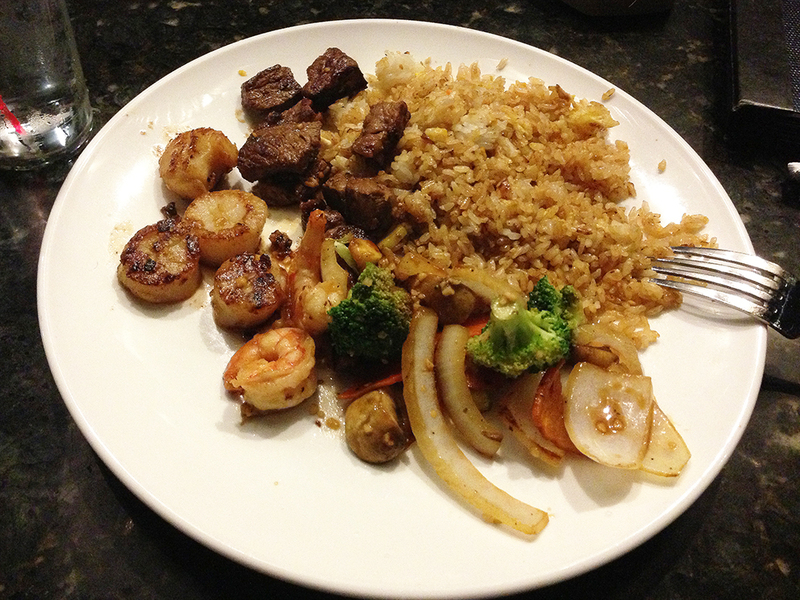 Try some creative fusion rolls or the hibachi grill and enjoy the atmosphere. It is not only the hibachi section that gives you different experience every time, the dining room too is inconsistent and you never get the same experience twice with the same food. In addition, it is very expensive for very unsatisfactory dishes. Thanks for reading and you make some good points. I agree that sometimes the food is inconsistent. It’s interesting, however, that so many people go to the restaurant. It’s very hard to get a table on a weekend evening because so many people seem to want to eat there even with the high prices and mid-level food quality.